This sign is on the Blue Ridge Parkway north of Floyd. Blowing snow has almost obscured the legend. To see a closer view of the sign, click here. We live near a section of the Blue Ridge Parkway that has no barrier gates because it is the only access road for farms in this particular area. On some mornings, this section of the Parkway may be impassible, but you have the right and the opportunity to terrify yourself with a ride on the wild side, because there are no barriers, except common sense, to keep you from driving on one of the most beautiful and dangerous roads in the area. The Parkway is not plowed and it freezes over frequently with long stretches of black ice on which tires will get no grip. In addition, the wind will whip over the ridge with enough force to drag a four-wheel drive vehicle sideways on the frost-covered road, even when there is no ice buildup. The reward for those foolhardy enough to take the risks is that the views are spectacular in bad weather. We had to make a trip north last week to transact business in Charlottesville and we decided to take the Parkway even though there were snow flurries and high winds in the forecast. We experienced high winds, but the snow never materialized and we got some spectacular shots of the oncoming storm. There is also a slippery little thing called “black ice” that I was warned about early on when the Parkway looks clear but there is a thin layer of ice you can’t see. A couple of my neighbors went off the road this way. 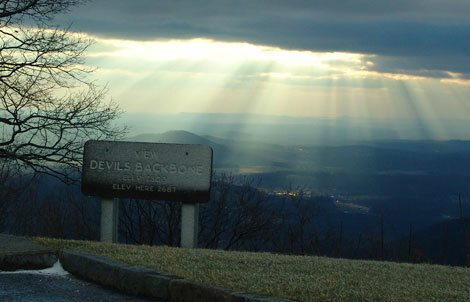 Devils Backbone, I love it down that way. My wife and I live within walking distance, through the woods, of Otter Creek.